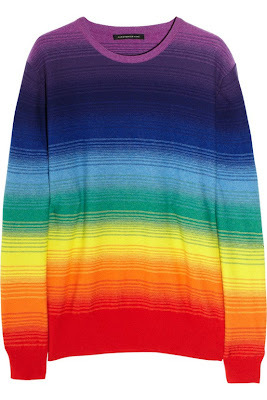 That sweater is extraordinary, love Christopher Kane! He has such a wonderfully creative mind and sees all the potential in knitting that everyone ignored for so long. I have no idea where to find a lookalike, good luck finding one though love! I'm sure you may have seen this site before....their Same Same section is a good one, though not sure about this one...what do you think? Honestly--I haven't seen anything like that sweater around. Somehow I think even when the trend is rainbows, most designers will still make most of their goodies in all black!